Good morning! 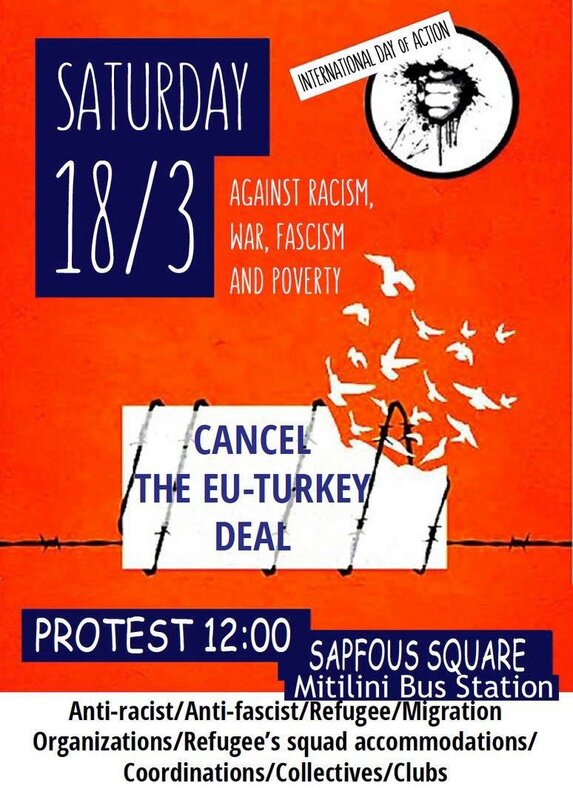 Today we will report live from the #18m Global Action Day against racism, fascism, austerity and the EU-Turkey deal and from the counter protests against the fascist demo in Leipzig, Germany. You can send your pictures, videos, reports and analysis to enoughisenough@gmx.net or use our submit page: https://enoughisenough14.org/submit/ Click at the refresh button of your browser to get the latest information. You will find the updates at the bottom of the page. You can find the call for the Global Action Day against racism, fascism, austerity & the EU-Turkey deal here. You can find the call for the counter protests against the fascist march in Leipzig, Germany here. Warming-up: On March 17 NIKA actvists protested against the ESI office in Berlin . The ESI designed the #EUturkeyDeal which has its one year anniversary. NIKA stands for “Nationalismus Ist Keine Alternative” or in English: “Nationalism Is No Alternative”. 01:01am Leipzig, Germany: At 09:00pm last night cops declared big parts of Leipzig (including the Connewitz district) to “danger zone”. Since then cops are checking id’s and searching people. 01:09am Leipzig, Germany: Cops are confiscating dangerous weapons like stickers from people in the Connewitz district. 01:54am We will have some sleep now. It seems to be calm in Leipzig at the moment. We will be back in about 7 hours with our live coverage. 09:22am Good morning! We will continue out live coverage now. 09:51am Leipzig, Germany: Phone number of the legal team (EA) for the counter protests in Leipzig is: 03412119313. Please only call when you saw somebody got arrested or when you are arrested. For general information please call the Info phone: 01753760675. 10:06am Leipzig, Germany: About 250 people at the starting point of first counter protest against the fascist demo of Neo-Nazi party “Die Rechte” at Leuschnerplatz now. 10:08am Leipzig, Germany: 350 people at starting point of first counter protest against the fascist demo of Neo-Nazi party “Die Rechte” at Leuschnerplatz now. 10:36am Leipzig, Germany: Antifa counter demo at Leuschnerplatz started marching. 10:55am Leipzig, Germany: Antifa demo is growing. About 1000 people now. Image by Twitter account @strassenstriche. Cops detained a nazi that did the Hitler salute near to the antifa demo. 01:17pm Leipzig, Germany: Cops stopped nazi demo because some of the nazis are wearing masks. The fascists tweeted that 170 fascists joined their demo. 01:21pm Leipzig, Germany: Nazis are marching again. #18M Cologne, Germany: Earlier today NIKA activists blocked the Deutzer bridge in Cologne. Banner reads Fight Fortress Europe! 02:41pm Leipzig, Germany: Nazis reach final point of their fascist demo. Many antifa counter protesters near the fascist demo. 03:10pm Leipzig, Germany: Nazis declared that their fascist demo has officially ended now. 03:30pm Leipzig, Germany: Again and again agressive cops grab people out of the group of antifa counter protesters. Take care of yourself and the people around you! 04:01pm Leipzig, Germany: Leipzig: According to cops 14 antifa counter protesters detained until now. Cops say detainees threw stones & bottles. 07:52pm Leipzig, Germany: All detained antifa activists were released again. We end our live coverage now. Thanks for reading. #Lesvos: Demonstration for freedom of movement and against the EU-Turkey Deal | Enough is Enough! Fascist Rallies in Leipzig – Thousands Join #Antifa Counter-Protests | Enough is Enough! The Big International Mobilization on March 18th and Those To Come | Enough is Enough!